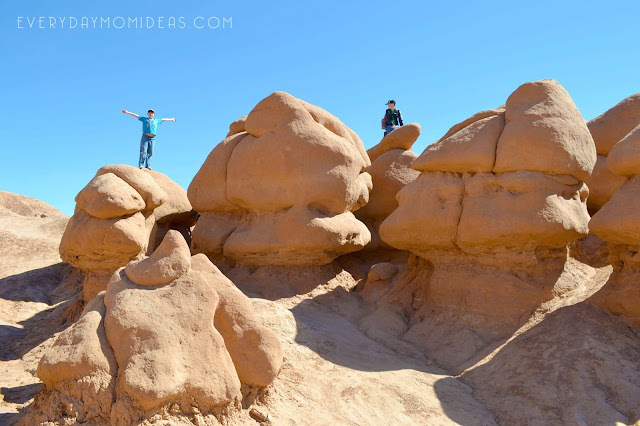 If you haven't taken your family to Goblin Valley yet it needs to go on your list of top family trips to take. This place was designed for the little explorer in all of us. I can't believe we haven't done it sooner. If you look really close in the photo above you can see two little heads in that hole way up there. Yep those are my tween boys. They couldn't get enough of all the places and crevices to explore. 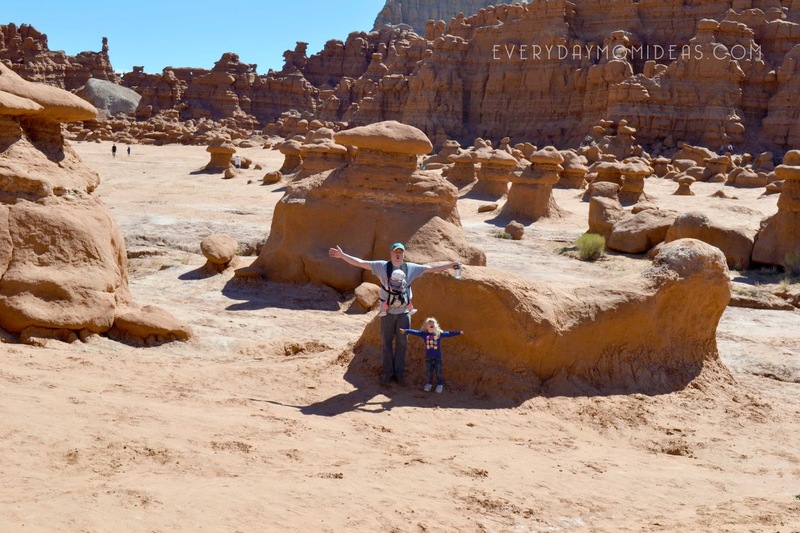 We went during spring break in April which turned out to be the perfect time to go because it can get really hot in this area of Utah. It was a perfect 70 degrees and not a cloud in the sky. September and October would also be a great time to go as well. It might just be too hot to go in mid summer though especially if you have toddlers and babies. There are NOT a lot of places to stay right near Goblin Valley State Park. There are some hotels in Green River (50 minute drive) and Hanksville (38 minute drive). You can also turn it into a camping trip. There are a few campgrounds near but they fill up months ahead of time. I would recommend you either stay in a hotel in Green River or Camp somewhere near Lake Powell like Bullfrog (2 hour drive). We stayed at the Holiday Inn Express in Green River for two nights and it was so nice to come back to a clean room, get a shower and sleep in soft beds. Our hotel also included a small indoor pool that stayed open late and a breakfast buffet, which was a double extra bonus. The customer service was great and we liked that we were able to get a roll-away bed and a crib added to our room for our girls. We found that Green River is kind of a middle point for a lot of other great little destinations around the area. 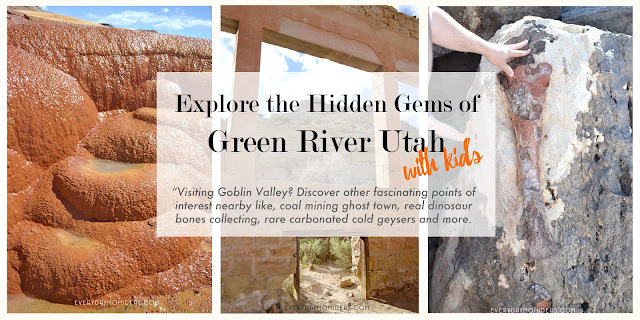 You can check out more about our Green River Family vacation in this blog post and also get insider tips on other little gems in the area you are not going to want to miss. 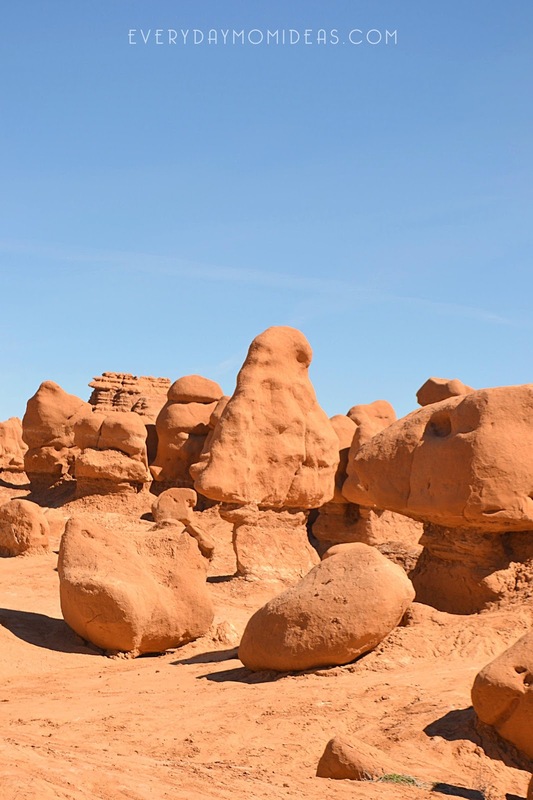 The famous Goblin Valley area itself is actually not that big and most of everything of interest is in this one area. Its big enough that it would take almost a whole day to explore all the areas. I would recommend spending two half days here to keep it fresh and interesting. There are tons of other points of interest in the area that I would try to divide the day up doing. 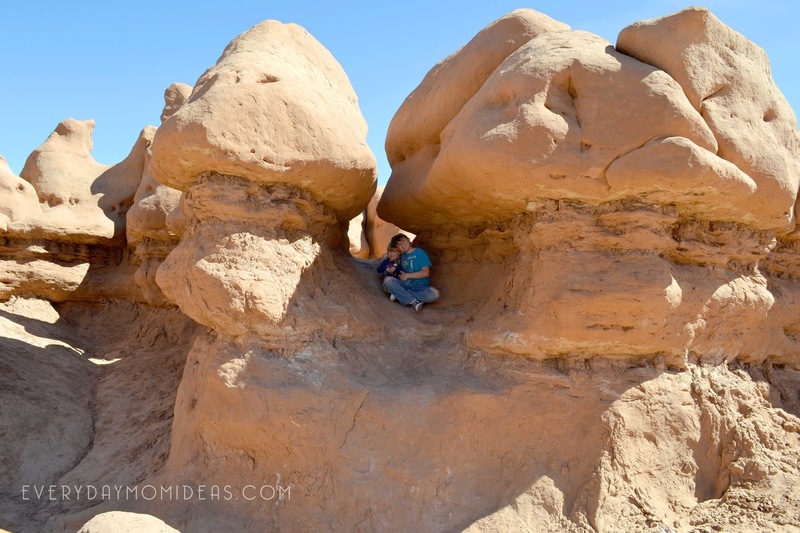 The kids were begging to come back the day after we went, to explore goblin valley some more and to play hide and go seek. We totally would have gone back for round two but we were on a tight schedule. We only had three short days to fit everything in. TIP: A friend of mine told me that Easter egg hunts at Easter are beyond belief here. 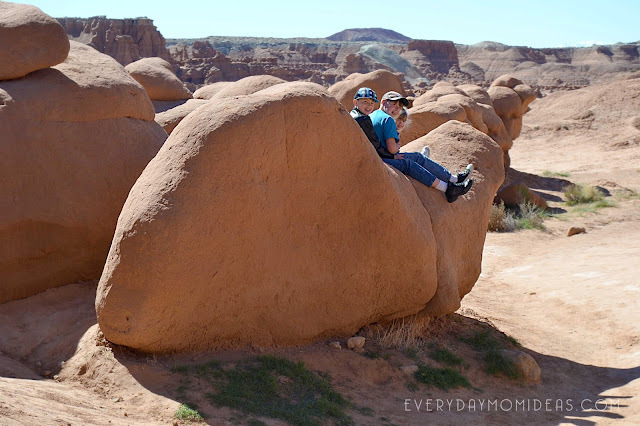 Here my kids are in a scene right out of Doctor Dolittle, riding a giant sandstone snail! But the very best part of goblin valley... it felt like we were exploring hundreds of little castles and goblin dwellings in a little city. There are sections all over the place that you have to hike up, climb through and duck under to explore. We played this game where we tried to imagine what goblins did in each area as if goblins where real. "This is where one of the goblins sleep... this is a goblin lookout... thats where the goblins hide during the day, put your hand in it!" Our boys are almost a decade apart in age from our girls and it is hard to find an activity that everyone can enjoy but Goblin Valley nailed it! Every few minutes one of our kids would yell, "take a picture of me!" or "lets go over here!" Even our eight month old baby girl had a good time... well, as long as she was kept fed and out of the sun. Bring lots of water. There is a drinking water spigot from a tap at the entry of the park but the water is a pinkish/orange color from all the sandstone in it. It is perfectly safe but we did not find it so very tasty. There are tables and a covered picnic area by the parking lot with a great overlook of the entire area of the Goblin Valley. There are no places to buy food for hours so pack in a lunch and lots of snacks. Picnic tables go fast on busy days so you might have to wait on a family to finish eating before getting to sit down at your own lunch. The park does cost money to get into. You can get more information and check out the fees here. 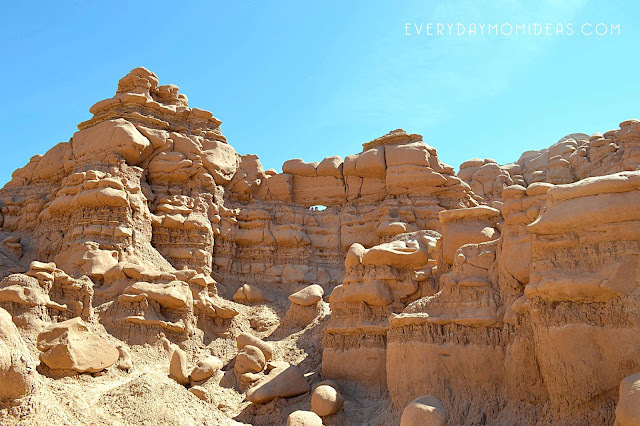 Goblin Valley was amazing but you would only spend half a day here at most. 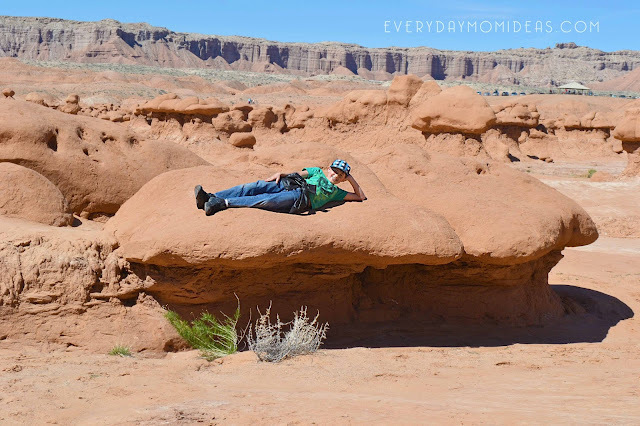 I recomend exploring the entire area of Green River over the course of a few days or even a week hitting different points of interest and camping at vaious locations. The drive between destinations estimate between and hour or two, so there is a lot of driving invloved. There are so many points of interest but they are spread out pretty far so plan your trip more like a road trip than one destination. 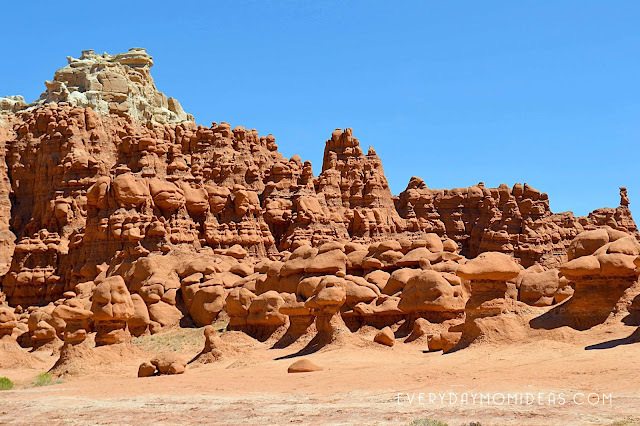 If you are headed to Goblin Valley you may be interested in this other article I put together (pictured above) Get recommendation for other fun little places to visit while down in the Green River area. 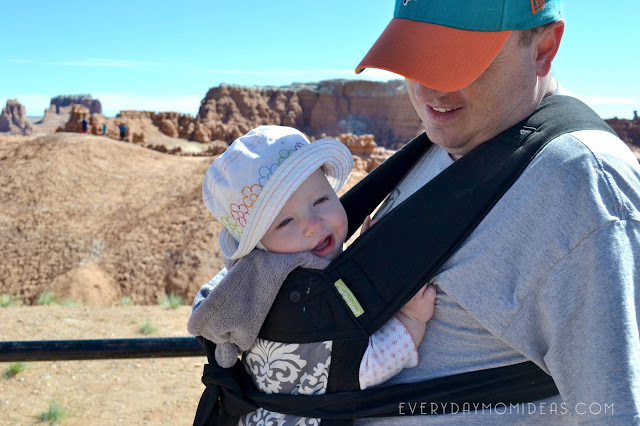 You won't want to miss these little hidden gems that are perfect for kids and families. Please share this Pinterest friendly image below with your friends and family or save it for later for your own family vacation to the amazing Goblin Valley State Park. Did you ever post more about your green river vacation? In particular I am interested in where else you visited. I need to. I was waiting to see if this article got any interest before I put in all the time to make a green river family vacation guide. Thanks for reaching out and asking. This is the motivation I need to post about green river. I am interested in your Green River post as well! Thank you for this post! So helpful for us in deciding to take the trek!! I would love to hear more about your Green River Vacation!! We are doing pretty much this exact trip next week for spring break, even staying at the same hotel! We have 4 kids ages 3 to 9 and I would love to hear what else you did in the area!